Help girls become master crime solvers! We will have volunteers work with girls to learn skills in memory, finding and analyzing evidence, and tracking progress through writing and photography. *Chemical engineers and photographers needed. Everyone is wanted. 4/20 6pm to 3pm on 4/21. The program center is located in the Quad Cities. Carpooling is an option for those wishing to volunteer. The center will accommodate 4 adults to sleep in bunks, and floor space to sleep up to 35 adults. The girls allowed to register is limited to 70, and all sleep on the floor in a larger separate space. Let us know if you can volunteer! 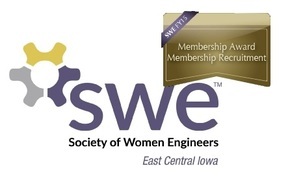 SWE-ECI tracks what Outreach Events our Members volunteer at - so let us know if you can help either Friday April 20th and/or Saturday April 21st. Follow up emails will confirm which days are available and any concerns (such as allergies) need to be addressed during your volunteer time.